Seven Stories Press, 9781609804787, 304pp. A close presidential election in November could well come down to contested states or even districts--an election decided by vote theft? It could happen this year. 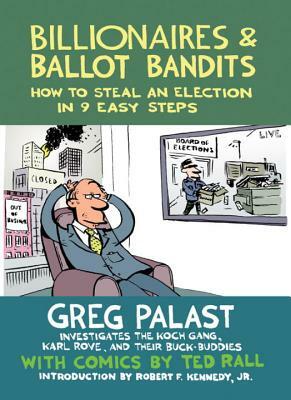 Based on Greg Palast and Robert F. Kennedy, Jr.'s investigative reporting for Rolling Stone and BBC television, Billionaires & Ballot Bandits: How to Steal an Election in 9 Easy Steps might be the most important book published this year--one that could save the election. Last week Billionaires & Ballot Bandits debuted on the NYT Bestseller list at #10 in paperback nonfiction. Billionaires & Ballot Bandits names the filthy-rich sugar-daddies who are super-funding the Super-PACs of both parties--billionaires with nicknames like "The Ice Man," "The Vulture" and, of course, The Brothers Koch. Told with Palast's no-holds-barred, reporter-on-the-beat style, the facts as he lays them out are staggering. What emerges in Billionaires & Ballot Bandits is the never-before-told-story of the epic battle being fought behind the scenes between the old money banking sector that still supports Obama, and the new hedge fund billionaires like Paul Singer who not only support Romney but also are among his key economic advisors. Although it has not been reported, Obama has shown some backbone in standing up to the financial excesses of the men behind Romney. Billionaires & Ballot Bandits exposes the previously unreported details on how operatives plan to use the hundreds of millions in Super-PAC money pouring into this election. We know the money is pouring in, but Palast shows us the convoluted ways the money will be used to suppress your vote. The story of the billionaires and why they want to buy an election is matched with the nine ways they can steal the election. His story of the sophisticated new trickery will pick up on Palast's giant New York Times bestseller, The Best Democracy Money Can Buy. Twice the winner of the Robert F. Kennedy Journalism Award and a Pulitzer Prize finalist, TED RALL is a political cartoonist, opinion columnist, graphic novelist and occasional war correspondent whose work has appeared in hundreds of publications, including the New York Times, Washington Post, Village Voice, and Los Angeles Times. He is the illustrator of the full-length comic in Billionaires & Ballot Bandits: How to Steal an Election in 9 Easy Steps, written by Greg Palast. "Billionaires & Ballot Bandits: The Theft of 2012"
The BBC reporter who busted Katherine Harris' fake felon purge tells weird, hilarious and sick stories of the billionaires who are bankrolling the GOP; with hot new info on the Koch Brothers as well as the filthy rich you've never heard of from his new book & film. "Bugs Bunny meets Hunter Thompson"
Palast’s prose has a zippy, breathless quality that might put you in mind of Michael Moore — “How does a ballot get spoiled? Not by leaving it out of the fridge” — but he’s also an expert in statistics who reports regularly for the BBC, Rolling Stone and other outlets. "The most terrifying book a Democrat could read. Billionaires and Ballot Bandits delineates the potential theft of democracy." "Palast ... chronicles how many of America’s super rich — the Koch brothers, hedge fund titan Paul Singer, Texan corporate raider Harold Simmons, among many others — have been patiently and prodigiously subsidizing campaigns not to “get out the vote,” but to keep it down."